This is an adorable shot! 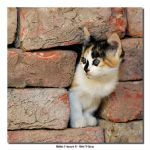 I just love the way you captured the moment, with the little kitten peeking out from between the bricks- you can really feel a connection with the photograph, as you stare into his (or her) blue eyes. It is quite original as well, something that can be difficult to find nowadays, due to all the cat pictures that exist. One portion that I feel could maybe be improved to heighten the impact would be the colors. As it stands right now, they feel a little washed out and a bit bland. I'm not saying to over-manipulate it to death, but maybe a little color balance or levels in photoshop? Really, though, this is more of a personal preference than anything else. Other than that, I couldn't really find much that needed improvement. Wonderful work! 52 out of 52 deviants thought this was fair. This is a charming treasure! NAWWW I WANNA CRUSH IT WITH LOVE... ANd rocks. 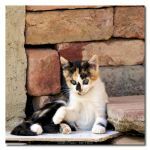 You have an incredible talent for capturing these adorable little ones. I could easily fave your entire gallery but I'll settle for adding a fellow cat lover to my watch. I love this. It reminds me of my first kitten when I was little. My father just pulled the little thing out from a wall in the cellar. It was like magic... and so began my lifelong affair with cats. aww ... what a lovely story ... thanks for sharing it! So beautiful little thing,love she's eyes. *gasp* OMG IT'S SO ADORABLE!!!!! I FAINT FROM TEH CUTENESS! 714 Ridge Avenue Ford City, PA, 16226? That was my old address, and the bricks are set exactly the same way. awwh what a cute kitten ! Nawwww that's so darn adorable! what a cutie !! luv it !! AH!!! I can't breathe....so CUTE!!! KYA!!! excellent shot! I love the color contrast and the textures!